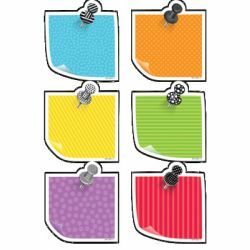 Catalog Home > Designer Cut-Outs, Sticky Notes, 3"
Designer Cut-Outs, Sticky Notes, 3"
Simple and colorful, these Sticky Notes 3" Designer Cut-Outs are a fun, versatile accent for any classroom project or display! 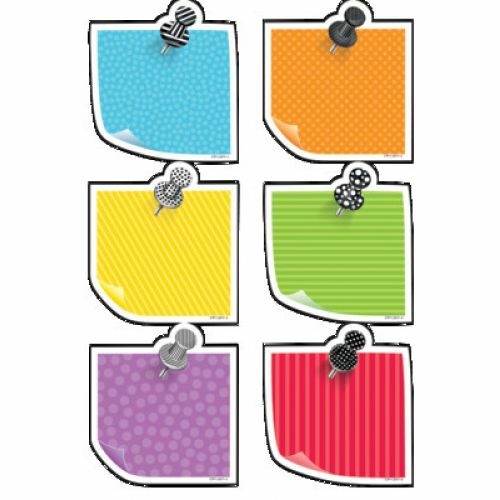 The bright colors of these paper cut-outs are accented with playful dotted and spotted push pins for a charming look. Note: this product does not have adhesive. Tip: Add any content (e.g. math facts, vocabulary words, or science photos, etc.) to cut-outs to make flashcards, learning cards, or other classroom activity cards.